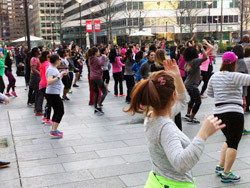 Get a free workout with Spring Training in Dilworth Park! On Tuesdays, Wednesdays and Thursdays this month, we're hosting a variety of sports and fitness programs, conducted by experts in the field of personal fitness. Yoga, fitness boot camp, running, cardio kickboxing- it's all here to get you informed and in shape for spring and summer. Spring Training is made possible through the generous support of the Rothman Institute and Jefferson Health. Get a complete schedule at DilworthPark.org. NOTE: There will be no Spring Training activities May 2-6. Join Master Jingshan Tang and his students from the Oriental Fitness Institute in celebration of World Tai Chi/QiGong Day! On April 30, Philadelphia will take part in this global event at Dilworth Park. Master Tang will lead group workshops and demonstrations in QiGong and several Tai Chi styles. All are welcome to participate in this free event! Combining kickboxing, boxing and other exercises into a program that utilizes a heavy bag to maximize results, for an hour of intense, calorie-burning fun. Space is limited to 72 participants, first come first serve. Gloves are provided. This is an all-levels, no-contact, no-fighting class. Presented by CKO Kickboxing. Take a moment to breathe, relax and quiet your mind midday while building up muscle, strength and balance. Be sure to bring your own mat. Presented by Optimal Sport Health Clubs. Each and every Wednesday, lace-up your running shoes and join a host of Philly runners for a 3-mile trek through Center City. City Fit Girls is an all-levels fitness and run group for active women who live and work in the city. CFG meets at the Dilworth Park information center. Zumba lets you get your body going with this all out, super calorie-burning dance party set to Latin and pop music hits. Presented by Optimal Sport Health Clubs. Optimal Sport Health Clubs, City Fit Girls, CKO Kickboxing and the Oriental Fitness Institute. This year, treat mom to a special Mother's Day BYOB brunch in the Logan Square Café at Sister Cities Park! There will be timed seatings at 9am, 11am, 1pm and 3pm. $30 per adult, $13 per child age 2-12 (Children under 2 are free). Pre-paid reservations are strongly suggested since seating is limited. Please click here, or stop by the café to make a reservation. Click here for the complete menu, which will be prepared by Tim Bellew Food. This BYOB event returns for another season at Sister Cities Park, featuring singer-songwriter style live music from 5:30-7:30pm each week. Logan Square Café inside the park will offer a special summer grilling menu and the Children's Discovery Garden will offer extended hours. *Chaddsford Winery will be on site. The Sister Cities Park Visitor Center is now open daily, offering custom itineraries, maps, brochures and the opportunity to purchase tickets to many of the city’s most popular attractions. The center is open daily 9:30am-5:30pm, and until 5pm on Sundays, starting May 1. You can also buy a PHLASH Pass then hop on the Philly PHLASH Downtown Loop at Stop 8, conveniently located at Sister Cities Park! Hop on and off with service every 15 minutes at 22 locations, 7 days a week, May 1-September 5. It's $5 for an all-day pass or $2 per ride. Children 4 and under and seniors are always free. SEPTA pass holders ride free. For more details, and a route map, visit PhillyPHLASH.com.